East European democracy: Sliding back or hollowed out? “2010 Fidesz fahaz MSZP sator” by Czank Máté – Public Domain via Wikimedia Commons. For some time analysts and commentators have understood that all is not well with democracy in Central and Eastern Europe. In the immediate aftermath, the region defied a raft of predictions that the dislocating effect of economic reform and resurgence of nationalist traditions would lead to a Latin American style breakdown of democracy. Democratic change and marketization were – certainly compared to other parts of the post-communist world – peaceful, quick and far-reaching, with the EU membership achieved within a relatively short time. Indeed, much conventional wisdom has it, that the incentive of EU membership ‘leveraged’ politicians and electorates in some CEE states away from illiberal and nationalist politics. In short, while CEE democracy might have been short on civil society and public engagement and high on corruption and inefficiency, it seemed consolidated and safe. All this seems to have changed since EU accession. 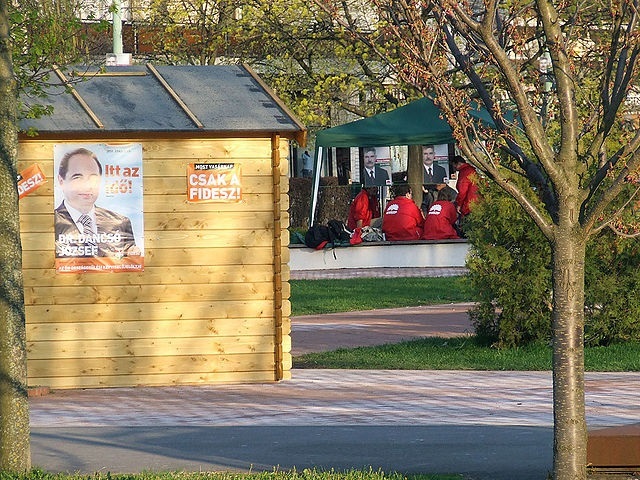 Commentators looked for and quickly found ‘backsliding’ in Poland in 2005-7 as short-lived minority government headed by the conservative Law and Justice (PiS) party, which included two small populist-nationalist parties as coalition partners, took office. And post-transition fears of breakdown seemed belatedly to come true with onset of the Great Recession in 2008-9 and the landslide victory in Hungary in the 2010 parliamentary elections of Viktor Orbán’s Fidesz. Orbán’s subsequent use of his huge majority to rewrite the Hungarian constitution, strip back checks and balances and entrench his party in deep in the state, media civil society are well documented, as are his questioning of liberal democracy and formulation of a deeply illiberal nationalist project for the future of Hungary. But discussion of the wider malaise seemingly gripping democracy in CEE has often been stronger on sounding the alarm and itemizing symptoms than on analysis. Indeed, the term ‘backsliding’ was so loosely applied that it covered phenomena ranging from the rise of right-extremism to difficulties negotiating coalitions. Much writing has simply boiled down to the idea that development across the region simply can be understood as Hungary writ small. Hungary’s illiberal political turn was a ‘cancer’ spreading to the rest of the region and Orbán, to quote the Guardian’s Ian Traynor simply the most prominent example of a new breed of ‘democratically elected populist strongmen … deploying the power of the state and a battery of instruments of intimidation to crush dissent’. Some journalists painting a bigger picture (or airing common geo-political concerns) preferred the term ‘Putinization’. But such broad-brush treatment would never do. Anyone who knows the Czech Republic, for example, would see a democracy disfigured by corruption, disengagement and distrust. But neither its assertive head of state, president Miloš Zeman, nor ambitious billionaire populist newcomer Andrej Babiš quite fit the bill of a Czech Viktor Orbán. A nationalist turn, a new constitution, a dominant ruling party or a spectacular breakthrough by the extreme right. None of this is on the Czech agenda – or indeed quite on the agenda elsewhere in CEE. Clearly a much better comparative take on how to understand the travails of CEE democracy is called for, capable of embracing the political realities of both Prague and Budapest and all points in between.